HP office printers and copiers to support your workflow needs. Discover what's available from our range of HP copiers. Ask one of our HP experts today. 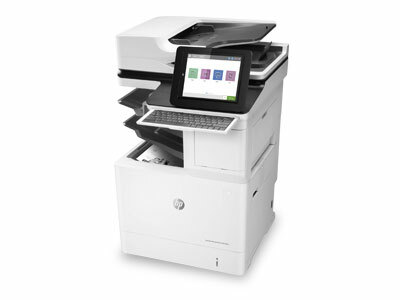 Our HP range includes a wide variety of models to meet the needs of your office's workflow. Choose from a selection of new and used models. Do your employees prefer hot desks over permanent setups? Select HP copiers come with cloud sharing capabilities to support your ever-changing office setup. Maintenance checks and toner refills can be included in your service agreement. This maintenance service is facilitated by our own team of repair technicians. All new and used HP office printers are covered under our warranty. Your model will be covered for a 90 day period which can be extended with a service agreement. Our latest range of HP copiers and office printers will give you access to cloud-based technology. Your office will enjoy the simplicity of printing and sharing from multiple devices and locations. Our entire range of HP office printers and copiers are refurbished by our very own repair technicians. Its just one of the reasons why we guarantee you're getting a reliable model in great working condition. For over 25 years we've stocked, delivered, and installed copiers and printers. We'll offer you a customised service agreement that caters to your office's budget expectations. Our technicians can answer same day service calls to get your photocopier repaired sooner. Our technicians can provide regular maintenance checks to keep your model in great working condition. All of our repair technicians have a minimum 15 years of experience working in their respective industry. The latest range from HP will change the way you print. Contact us to find out more about our new HP models. Call or email us to discuss what you want from a new HP copier or printer. Our experts are also available for a face-to-face meeting if you prefer. 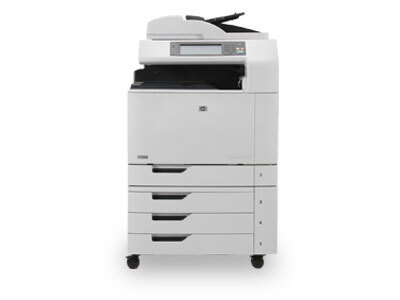 We'll provide you with quotes on HP copiers we think are perfect for your workplace. These models are based on your budget and workflow expectations. After choosing your preferred model, it's time to discuss payment options. Finance can be arranged for new and used HP copiers. A lease can be arranged if you prefer a short-term plan. After you've signed off, we'll confirm a suitable date for delivering and installing your new HP copier. Our technicians will ensure your new HP model is connected to your office network. Your new HP printer is ready! Your new HP photocopier is ready for everyday use. Our technician will walk you through the copier's basic functions before the handover is complete. Can I purchase a new or used HP photocopier from Copysonic? Yes, you can. We stock a great range of new, used, and ex-demo HP copiers and printers. All used HP copiers are refurbished by our very own technicians. Can you repair and service HP photocopiers? Yes, we can. Our dedicated team of repair technicians have been working on HP copiers for years. They have the expert knowledge and experience to get your HP back in working order. What type of warranty can you provide for a HP photocopier? A 90 day warranty or 10,000 print warranty is available with the purchase of any HP copiers from our range. It really depends on how your office intends to use the model. We'll let you claim whichever warranty comes first. Can you set up my HP photocopier for networking capabilities? We certainly can. When your new HP copier is delivered, our technicians will ensure it is connected to your local network. Fill out the form, and one of our HP experts will contact you.